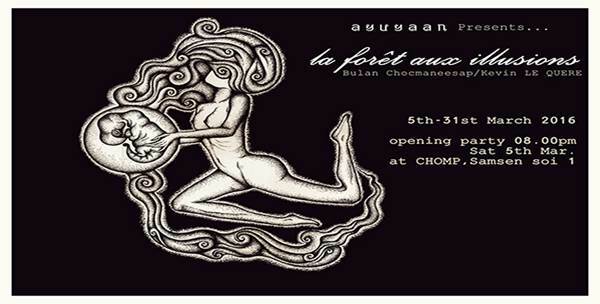 Bulan Chocmaneesap & Kevin Le Quere present exhibition The Forest Of Illusions. Mostly work is inspirations by motherhood spirit, as same as every mother will get it,so i turn my experience and subconscious mind to painting,drawing,installation and repaint ball joint dolls a bit of mix media and etc. The hallucination on my experience trip (base on canabinoid) became to art as i believe our mind going back deep inside our DNA and we'll see ourself from each own experience. and a bit of psychedelic / Dark beauty and sometime is depend on my currently moods,How i feel inside my mind. Stippling ink,dot work,in mostly Gray black and white tone and especially from Squid ink ( inspiration from my childhood ) a doll repaint and paper mache,and simple equipment what i can find around and The wire work collaboration with Kevin Le Quere.